From the bar to the dishroom, commercial sinks and faucets play a vital role in your operations and the welfare of your guests and staff. 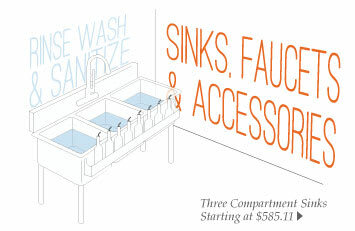 These 3-compartment sinks have a section each for washing, rinsing, and sanitizing. They're often required by code, even in kitchens with dishmachines. Implement good sanitation practices and keep your health inspector happy with the right hand sink in your kitchen or employee lounge. Bar sinks tuck neatly underneath bars and countertops, making a discrete place to wash wares, hands, or to empty drinks. Choose a 2-compartment sink to thaw and prep food like meats and bagged sides, or to use as a vegetable sanitizing and prep station. KaTom's selection of portable hand washing stations will keep hands clean and meals safe no matter where your business takes you. Find your sink here. A 1-compartment sink can be used for everything from prepping produce to soaking pots and pans. Find one for your bar or scullery here. Floor-mounted mop sinks give your janitorial staff a convenient place to rinse mops and empty buckets. A sanitizing sink heater raises water to the 180 degree F point required for proper sanitation as the last step in the warewashing process. A 4 compartment sink can be your all-in-one warewashing station, where you can scrap, rinse, wash, and sanitize your dishes safely and efficiently. Time- and money-saving garbage disposals are available here, along with the parts you need to keep them running smoothly. From pre-rinse units to glass fillers, find the commercial faucets you need for your establishment here. This selection of kitchen sink parts and sink accessories includes stoppers, strainers, sink covers, splash guards, and more. There are no cookie-cutter solutions for restaurant sinks and faucets. There as many ways to configure them as there are establishments that depend on them, and your plumbing setup is highly customizable. The fixtures that work in the restaurant across the street may be ill-suited for your business, and seemingly small variations in equipment can make a huge difference in how efficiently your kitchen runs. It pays to explore all the options that are available when you go to outfit your kitchen and dishroom. It's easy to assume that higher water flow means greater washing efficiency, but that's not necessarily the case. Low-flow commercial faucets can save a surprising amount of money on utility costs - as much as thousands of dollars annually in some establishments - without sacrificing speed and effectiveness. Lower-volume faucets can cut down on the safety risk created by wet floors and cross-contamination that can be caused by splashing water. Faucets that are too weak or too strong can even violate health codes. You're required to have a compartment sink even if you use a warewasher. If you wash all your wares in a dishwasher, you're still required to have a fully-functional three compartment sink that's capable of being used to rinse, wash, and sanitize your equipment, cookware and dinnerware. That's a precaution in the event that your machine should stop working, you'll have a backup plan for getting your wares clean and sanitary until it can be repaired. You're required to have designated handwashing sinks. Allowing your staff to wash their hands in restaurant sinks that are used to wash food or wares can land you in trouble. Every commercial kitchen is required to have designated handwashing sinks that are reserved strictly for that purpose. Depending on how close those commercial sinks are to food prep and cooking areas, they may be required to be fitted with side splashes as well to prevent splashing water from contaminating food. Dishroom design is about more than convenience. The dishroom is sometimes an afterthought when it comes to laying out a commercial kitchen, that means it can get stiffed on space, but you can be sure your health inspector won't forget about it. That's why it's critical to designate separate areas for clean and dirty dishes. Allowing clean and dirty dishes to land on the same surface can land you a violation.